It’s easy for unpleasant odors to accumulate in an enclosed space like a car cabin. We have cleaned thousands of cars, and quite a few had interiors that smelled like cigarettes, old laundry, or dirty pet fur. We recommend that clients top off their car wash or auto detail with a car air freshener. This way, the vehicle smells just as clean as it looks. Fresheners come in different styles, some of which we will review. This is the most basic car fragrance and often included as a complimentary gift after a professional auto detail. 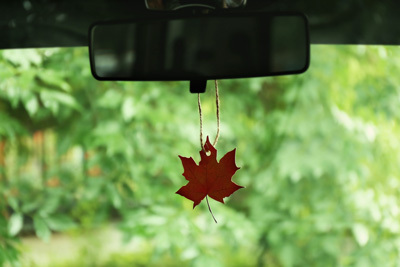 These are the ones often in the shape of a fir tree that you hang from the rearview mirror. While they’re inexpensive, the scent only lasts for about a week. This is why they’re often sold in bulk. These come in a miniature tin similar to a can of cat food. Most brands use a gel-based scent. You can stick it right on the dashboard in place of or next to your beloved hula girl or bobble-head. Vent sticks are clipped to the air vent. Air from the vent releases the scent. The end of the stick comes in various designs, doubling it as a miniature car décor. Plug this in your car’s adapter. The energy emanating from the power outlet releases the fragrance and freshens the entire cab. Most types have a built-in heat source that gives off a cool glow when activated. The scented oil capsule can be replaced with a refill. The plug-in unit itself however, can be reused. Keep your car looking spotless by bringing it to Bellingham Detail and Auto Glass. Our car protection package will keep your vehicle looking like it was just driven off a dealership. You can complement the restoration with a car air freshener to give your nostrils a pleasant stimulation. Posted on February 28, 2017 under in advice | By ignite.